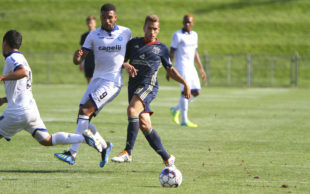 A desperate, well-prepared, experienced Penn FC side burst Bethlehem Steel FC’s August bubble emphatically at Goodman Stadium Sunday afternoon 3-1. For the first 20 minutes, Bethlehem had the clear edge in the game. Possession, shots, quickness to the ball, creative combinations were all areas of superiority. But for the next 70, Penn negated most of those trends. Bethlehem maintained a 60-40 possession edge throughout, but the possession’s threat dimension was greatly reduced, as the Steel slowed down and Penn’s midfield figured out how to impede Steel creativity. Penn’s adjustments meant they could double team the ball carrier anywhere in their defensive third, and often in the midfield. Bethlehem’s season-long tendency at home to come out in the second half with renewed energy and rejuvenated ideas simply did not happen. The emotional well seemed to have run dry. The game was marked by increasing chippiness between the sides that referee Lorant Varga did not control well, as his early, decisive, appropriate suppression thereof eroded into frustrating inconsistency. The frustration was on both sides as all fans present can now identify each head coach by voice, understandably raised in complaint. Bethlehem scored first during its opening period of dominance as Marcus Epps buried an attempted Penn backpass that had been deflected to him by Fabian Herbers. Epps had a post in the seventh minute earlier and an upper 90 crossbar in the 19th. Penn’s adjustments quieted him decisively for the rest of the game. Penn’s first goal was an excellent unstoppable 30+ yard blast by Aaron Dennis in the 32nd minute on a feed from Miguel Jaime. The second was a fast counterattack off a Bethlehem corner kick in the 39th with only James Chambers and Olivier Mbaizo back deep. It quickly became a textbook 3 v 2 with Chambers laboring to retreat when Mbaizo failed on an over-aggressive attempt to tackle leaving the captain 1 v 3 inside the box. Lucky Mkosana did not fail to convert Paulo Junior’s easy feed. 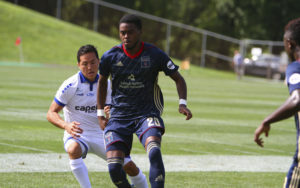 The third Penn goal came from the third of the attackers from Pennsylvania’s capital, Paulo Junior, when Prosper Chiluya tried to play him offside not realizing that Matt Mahoney was deep enough to keep him on. The Steel next play Friday night in Pittsburgh against a Riverhounds side that will be angry it gave up two goals late to rival FC Cincinnati. An MLS 2 side: Bethlehem’s player development purpose contributed to the loss. First-teamers Herbers and Epps seemed to lose their edges of extra effort after about 20 minutes, but Herbers played the whole match and Epps most of it. At striker and attacking center mid, teenagers Faris and Brenden Aaronson were up against former MLS center back Ken Tribbett and his partner Kyle Venter. The teens were credible competition for the adults but unable to impact the game. Penn Tactics: The tactical adjustment made during the game by Penn coach Raoul Voss was that his three midfielders dropped deep into zone 14 ignoring the space left uncovered in the opposite outside channel. They were usually the source of the extra man used to double-team the Steel’s ball carrier. And Penn clearly intended to play through Lucky Mkosana, who was playing the center of the their three forwards and would drop back into the midfield to receive and distribute. The effect of Mkosana dropping back was to overload the Steel’s central channel defense. Playoffs: Bethlehem still lie fifth in the points table tied with Indy on points but ahead with one more win. However, they have only five left to play. Losing at home was not coach Burke’s plan. The Steel remain fifth because competitors failed to seize available points this weekend. Bethlehem: Jake McGuire*; Olivier Mbaizo*, Ben Ofeimu**, Matt Mahoney, Prosper Chiluya; James Chambers, Drew Skundrich; Marcus Epps* (Michee Ngalina 80’), Brenden Aaronson** (Chris Nanco 70’) Fabian Herbers* (Santi Moar 59’), Faris. Unused Substitutes: Kris Shakes**; A. J. Paterson, Aidan Apodaca.